From March 21-25th, 2015, I was given the opportunity to attend the 249th American Chemical Society National Meeting in Denver, Colorado. The theme of the meeting was National Resources. 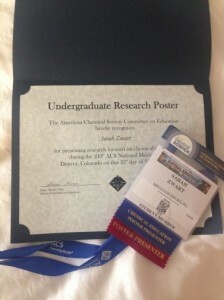 My certification from the poster session, and my American Chemical Society National Meeting I.D. Also, throughout the duration of the meeting, I was able to attend several different talks and lectures focused on subjects such as organic chemistry, biotechnology, environmental chemistry, chemistry education, and polymer and colloidal chemistry. From these talks, I was able to gain insight into what work these different fields of chemistry entail, and new research happening in each field. 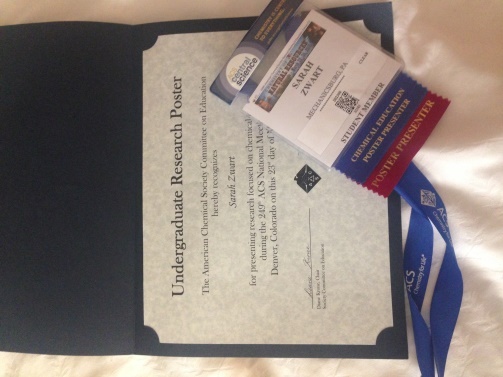 Through the lectures and the poster session, I was able to connect with several of the speakers, as well as connect with other undergraduates across the United States. 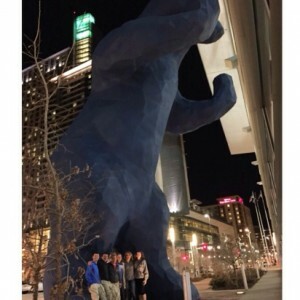 The representatives from Messiah College’s Chemistry and Biochemistry Department under the iconic bear at the Colorado Convention Center. 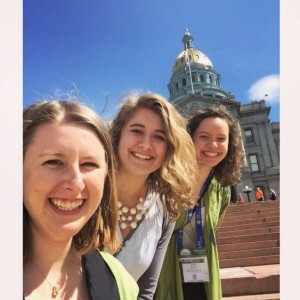 Messiah students, Lauren Martin, Sarah Zwart, and Anna Love (from left to right), at Denver’s capital building. I have been involved with research at Messiah since the summer of last year,and as part of this conference I had the privilege of presenting a poster at an undergraduate poster session based on my research. My poster on “Characterization of Self-Assembling Monolayers on Zinc Selenide” at the undergraduate poster presentation. 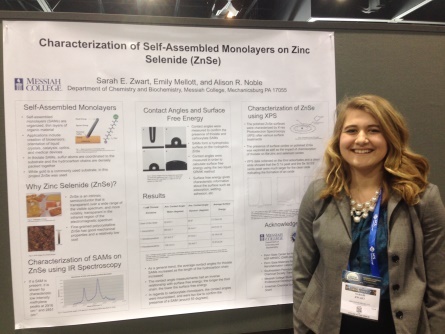 Beyond networking, the poster session allowed me to practice the valuable skill of presenting my research to professionals in chemistry. It also was advantageous because of the valuable insight and suggestions my peers and other professors were able to give me about the work that I had completed.